by measuring the slight movement of the chest. The examples are almost endless. This is where Acconeer AB enters the picture, because the company’s radars do all these things and more. Since radio signals penetrate just about anything other than metals and water, these tiny radars are easy to integrate into devices such as smartphones, vacuum cleaners, and plastic-covered slots inside car bodies. Acconeer radars are also unaffected by stray light and dirt. They consume a minimal amount of battery power, and they can be programmed to perform a large variety of measurement tasks. One limitation is the relatively short reach of the radar signal – approximately 2 meters (6 feet), but the company is working on extending it to 10 meters. Acconeer AB was founded in 2011 by Dr Mikael Egard and Dr Mats Ärlelid, together with Mårten Öbrink, Professor Lars-Erik Wernersson, and Lund University. The CEO is Lars Lindell. The company is represented in the US by DigiKey Electronics in Thief River Falls, MN, and also in Korea, China, Japan and Russia. The Acconeer website (www.acconeer. com) provides details about their product line, along with videos that explain some of the practical applications for the company’s radars. parts of the world. The daylight has a special quality, perhaps because it reflects the golden beach sand. Impressions are amplified by memories from one’s childhood. 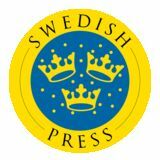 n the March 2018 issue of Swedish Press we published an exclusive interview with Karin Olofsdotter, the Swedish Ambassador to the United States. In our follow-up interview she reminisces about growing up in Halmstad and highlights the city’s many attractions for today’s visitors. 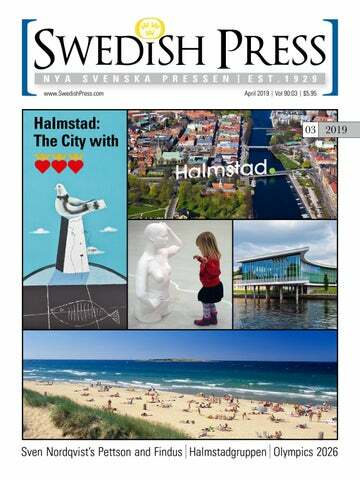 Please describe your childhood and your enduring roots in Halmstad. I was born in the 1960s in Söndrum a few kilometres from Halmstad city centre. That is where I went to school, and then we moved to nearby Frösakull on the seafront. My parents still live in the house that they built there in the 1970s. They are now 89 and 85 years old and live comfortably thanks to excellent support provided by the Hemtjänst (home care services). My mother remains quite active and plays golf. I visit my parents as often as I can. Why would someone from the USA or Canada want to visit Halmstad? Halmstad is a city with a population of around 90,000. North Americans visiting Halmstad will receive an authentic impression of what Sweden is really like and how the Swedish middle-class lives, because the city is of a size that is easier to grasp than bigger ones like Stockholm and Malmö. A holiday visit to Halmstad is particularly recommended in the summer when the sea temperature reaches 25 deg C (78 deg F) and beyond, something people who are not from there find hard to believe. For anyone interested in playing golf it is a veritable paradise with 7 or 8 golf courses; the course in Tylösand is one of the finest in Europe. The sea, the scenery and the golf are perfect for people who enjoy the outdoors. Halmstad is a perfect destination for anyone in search of something different. alk around the port city of Halmstad and you’ll be struck by the crowned hearts adorning everything from bus stops and trash cans to garden gates and grocery stores. Pay close attention to the architectural influences in the old town square, near Saint Nikolai Cathedral, and you’ll catch sight of some of the northernmost timber frame houses in all of Europe. These small details – potentially insignificant to the undiscerning eye – are subtle remnants from a time when Denmark ruled Halmstad and the surrounding Halland province. areas and also measure their strength through a number of forward-looking factors,” said Anna Sönne at Dagens Samhälle. “The ambition is to identify exciting examples of how to successfully run a municipality.” Halmstad has secured its title as a coveted area to live in and will continue to evolve in years to come. Engraving of the City of Halmstad by Johannes van den Aveelen for Suecia Antiqua et Hodierna, 1690-1710. Grupporträtt av Halmstadgruppen, Stellan Mörner, 1936. Olja på duk, Halmstads kommuns konstsamling/Mjellby Konstmuseum. Bilden är beskuren. he was fortunate to find a patron in the Mayor of Halmstad, Georg Bissmark, who sponsored his travels to Paris to study painting. From 1950 onwards he devoted himself almost exclusively to painting surrealist murals in churches all over Sweden. In contrast to his colleagues in the Halmstadgruppen, Stellan Mörner – or more accurately Count Carl Stellan Gabriel Mörner af Morlanda (1896 – 1979) – spent his early years on the family estate Esplunda near the city of Örebro. After obtaining a degree in art history, he travelled to Germany, Italy and France for further study. Many of his surrealist paintings feature castle interiors, probably inspired by his upbringing at Esplunda. In his later years he also became known as an author and a talented theatre stage set designer. His death in 1979 spelled the end of the Halmstadgruppen, even though the remaining members lived on for another few years. Art enthusiasts will find a comprehensive collection of works by the Halmstadgruppen at Mjellby Art Museum near Halmstad. The permanent exhibition, currently closed for restauration work, will re-open on May 11, 2019. See also www.mjellbykonstmuseum.se. Waldemar Lorentzon: View from the terrace.